Always dreamed of having an outdoor kitchen? Then let us make that dream come true! Take advantage of those warm summer nights by cooking out in the dry air and enjoying outdoor living in your yard. 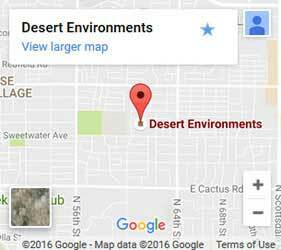 And Desert Environments are just the people to help! Whether you have a busy nightlife and regularly want to entertain guests or simply want to cook for you and your family, our outdoor kitchens in Phoenix are sure to impress! What custom outdoor kitchen features do you use? 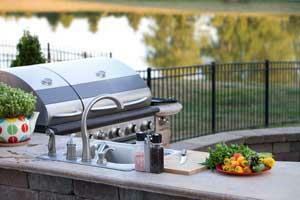 >A quality grill is the heart of many outdoor kitchens. Let us create a grill island or integrate it into your countertop. Like the rustic approach? Fire pits are an option not only for warming, but for cooking several types of food as well. Thought you had to go inside for water? Think again! We can get a custom sink installed outdoors! If you want more cooking options, we have propane stoves, outdoor ovens, and many others to choose from. No problem! While built-in barbecues and refrigerators are common options, we can do practically anything you want. Thinking of outdoor entertaining and want an integrated speaker system on your gazebo that covers your bbq island? We can do that. Need extra prep space for gourmet meals? We'll make sure they meet your expectations. Don't like your current setup and want some landscape design help such as adding a new brick pathway to your outdoor space? Sure thing! Whatever you want, we'll do what we can to make sure it works as you envisioned. When it comes to helping with your backyard environment, no one in Phoenix will give you the same level of service, value, and customization as us. We work alongside you every step of the way to make sure you're satisfied. Our team is always open to any adjustments you come up with along the way. So call or contact us today to get started on that outdoor kitchen, gazebo, or water feature you've always wanted!